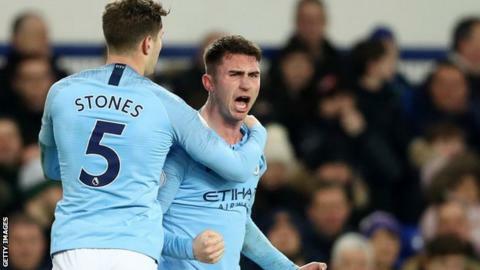 Manchester City defender Aymeric Laporte has signed a two-year contract extension at the Premier League champions, taking his deal to 2025. The French centre-back joined City from Spanish La Liga club Athletic Bilbao for a club record £57m in January 2018. Laporte, 24, has established himself at the heart of Pep Guardiola's defence, making 36 appearances in all competitions this season. "This club offers me everything I need to improve my game," he said. "I've already made great strides and I want to continue getting better and better. "Obviously, I want to win silverware and I feel City is the best place to fulfil all my ambitions." Despite his form for Guardiola's side, Laporte is yet to be capped by France and claimed last year he was being overlooked by Les Bleus boss Didier Deschamps because of "personal reasons". "Aymeric is a huge talent and the fact he has committed his best years to us is something to celebrate," said City's director of football Txiki Begiristain. "We knew before we brought him here that he had outstanding potential but his improvement over the past 12 months has been exceptional. "We want to construct a young, vibrant side and Aymeric fits perfectly into our plans. His style of play suits us and his attitude since the day he arrived has been first class."